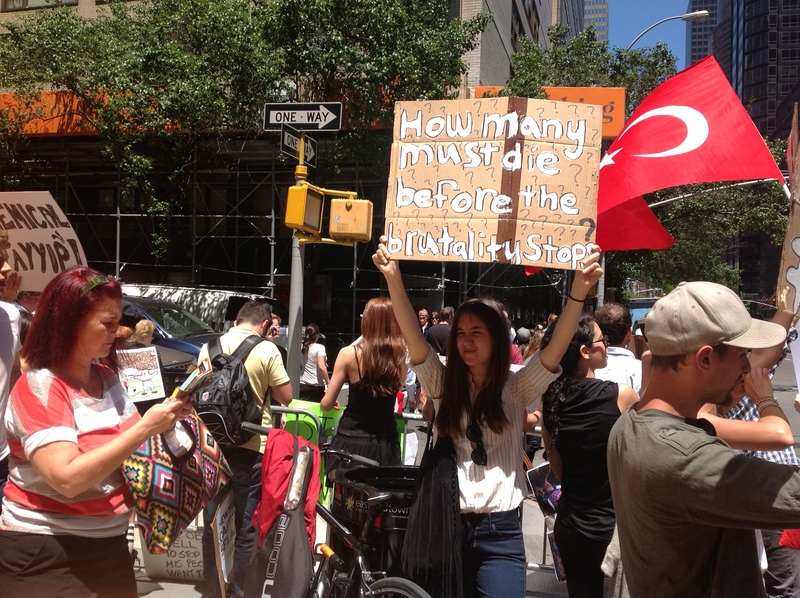 The crowd of 150 or more outside the Turkish consulate in midtown June 4 was not filled with seasoned activists. 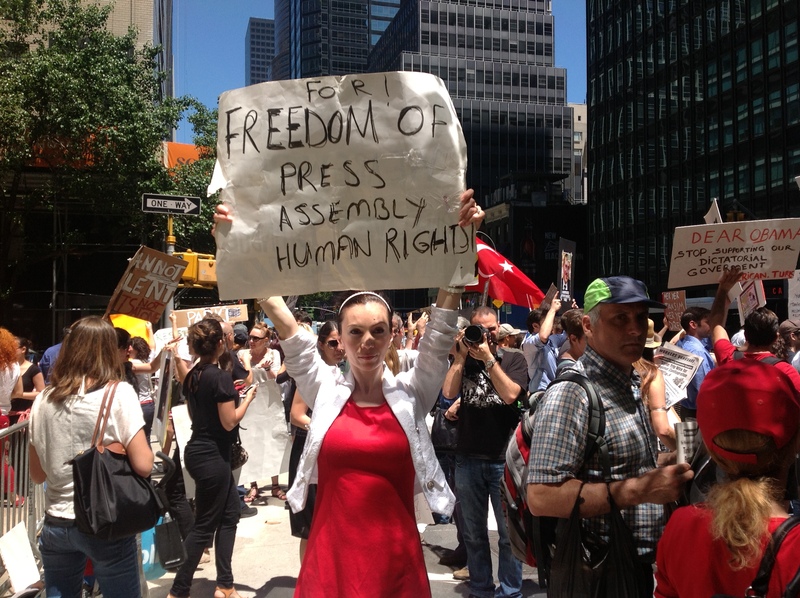 Mostly in their early twenties and studying in the New York area while working low-wage service jobs, if they can find any, these solidarity protesters appear to be like their Turkish peers back home who we’re watching on TV and YouTube. In fact, they are the brothers and sisters and friends of the Turks taking to the streets in dozens of cities. Few of the students I talked to at the solidarity protest had considered themselves self-consciously political before the rebellion that started in Istanbul began to consume their every waking hour. They are mostly young, the children of Turkey’s middle class and they see themselves fighting for their futures and the direction of their country. Fadime is a CUNY Grad student whose first words to me were, “We do not want US intervention. We want to be heard, we can take care of this ourselves.” It was a sentiment echoed by many concerned that the United States would try and manipulate this crisis for its own ends. They are right to be cautious about US intentions. Every protester had stories of family and friends suffering terribly from the beatings and gas. June 4 was Destine’s birthday and she awoke to birthday messages from friends back in Turkey saying they wanted to send her early wishes because they aren’t certain they’ll be safe or even alive by evening. The extreme brutality of the Erdogan regime is driving an intensity and political focus many here—and there, it appears—had never felt before. What’s striking is how adamant these young Turkish women and men are about the need for winning a secular and democratic society back home. One where Kurds, Jews, Armenians, gays, everyone feels welcome, safe and respected. Over and over again, they repeated their desires for universalism and their hostility to Erdogan’s power grab and religious sectarianism. One student who preferred to be identified simply by her initials, MK, insisted, “I am here for the women who have lost their lives.” She talked about the lack of punishment and public condemnation of honor killings and domestic violence generally. These protesters do not adhere, at least not yet, to any particular ideological program. They do not yet see a party or platform that they support in significant numbers. But they are intent on being heard and respected and winning, at the very least, public acknowledgment of their grievances. It is the start of something for them, but it’s not yet clear what. When I told them of a mass trade union march in NYC on June 12 at City Hall, they were excited at the prospect of linking their struggle with ordinary US workers. When I suggested they leaflet at this weekend’s Left Forum where at least 2,500 are expected at Pace University, they diligently wrote down the details. They are just now joining the global rebellion against the status quo. They’re hopeful and outraged.